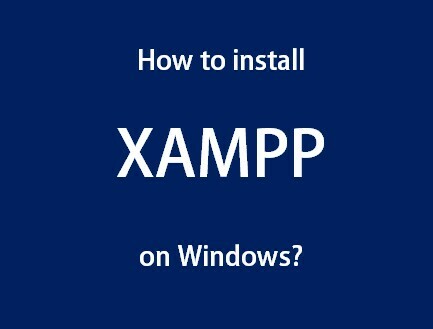 How to install and run XAMPP on Windows? Click on the XAMPP setup file and follow instructions to install XAMPP. The default XAMPP install location is “c:/xampp”. 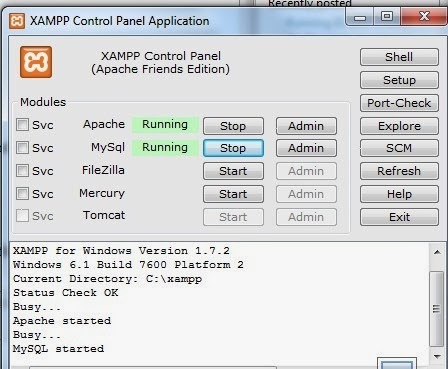 After XAMPP is installed on Windows, XAMPP Control Panel shortcut should be on the desktop. If not, navigate to “Start > All Programs > XAMPP > XAMPP Control Panel”. Start APACHE and MySQL: click on Apache and MySQL start buttons. Note: Localhost issue when using IIS and XAMPP on the same machine? If you just installed XAMPP on a computer already running IIS, see here how to resolve Apache localhost port number issue and run both IIS and XAMPP on the same machine. If everything is alright till step 6 above, you should be able to see the Apache localhost page. Click on the “Security” link on the left hand side menu on the Apache page. If you would like to change the default MySql root password, do it here. The default MySQL SuperUser is “root”. You may change the default password which is “root”. From the Apache page, click on the phpMyAdmin link at the bottom left hand side of the page. Login with the MySql username and password. Your XAMPP is up and running. Now you can install PHP-based CMS such as WordPress, Drupal, Joomla etc. See here how to install WordPress on XAMPP?